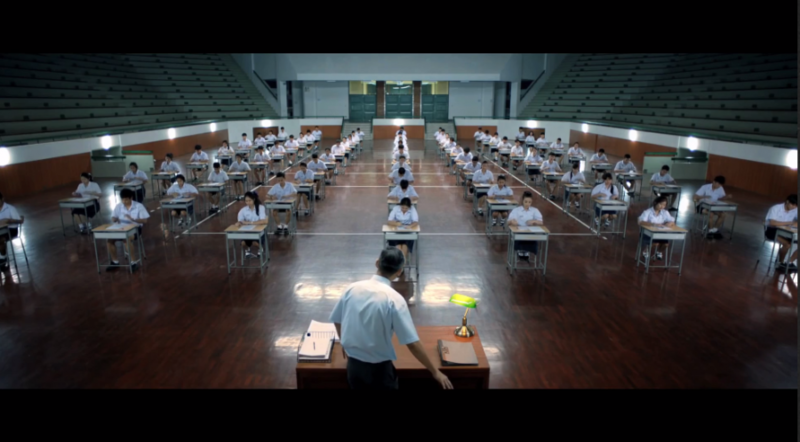 Still from the Bad Genius trailer. High stress, sweaty palms, and the weight of expectations. It’s that time of year again. It’s exam season. Well, maybe not for us quite yet. But for the students in Bad Genius it is, and they’ll do anything to pass their high school exams. Or at least anything but study. This Thaï film directed by Nattawut Poonpiriya blends the tension of trying to get away with cheating on a high school exam with the high stakes drama that you’d see in a film like Mission Impossible. High school student Lynn—played by Chutimon Chuengcharoensukying—is a brilliant mathematician who gets accepted into a prestigious school on a scholarship that promises to let her study for free thanks to her academic aptitude. But she soon finds out that the headmistress conveniently failed to mention that her scholarship doesn’t cover other expenses like “school maintenance,” which still adds up to a high sum of money that has to be paid. To beat the system that cheated her, Lynn agrees to help out her friend Grace—played by Eisaya Hosuwan—for a price. Lynn devises a system where she drums her fingers on her desk in different musical patterns that she’d play on a piano. Each pattern would indicate which answer to fill in on the test sheet—A, B, C, or D. All Grace had to do was memorize which pattern was which and watch Lynn during the test to know the answers. The editing and pacing of Bad Genius was well done, making each scene a tense experience for the audience to watch. Every time Lynn tried to pull off another elaborate cheat, the energy of the audience became strained as we all silently prayed that no one would get caught. The use of sound was interesting as well, acting as a means to increase the tension in some scenes. It would raise in volume and become almost deafening whenever the situation got risky and dangerous for either of the characters that were in on the scheme. Chutimon Chuengcharoensukying as Lynn in Bad Genius. Still from the Bad Genius trailer. A good example of the use of sound and editing in the film was one of the earlier instances of cheating. The sound increased in volume as Lynn was forced into making a snap decision to help her friend. Once Lynn knew what she had to do, the editing was done quickly to reflect how fast Lynn had to move before her teacher took notice of what was going on. Once she pulled it off, the audience let out a breath they didn’t know they were holding. This kind of audience reaction was consistent throughout the screening of the film with each scheme that Lynn managed to successfully execute. Some audience members would even clap in relief and admiration. The act of cheating on one’s test was framed as something both good and bad in this film. Yes, we all wanted the students to succeed in their plan because we knew that the consequences would be severe if they failed. But as things started to get riskier, all we wanted was for Lynn to call it quits and let her friends finally just pick up a book and study for a change. Although what Lynn was doing was immoral, the audience felt the need to cheer her on mainly because of how well thought out her plans were. And, of course, because she wanted to help her father pay off her tuition. We understood that it was a means to an end. Bad Genius was an energetic film that drew in its audience. From the intricate plans that were played out in front of us to the more quieter moments, the film kept us hooked if only to see what would happen next to our main scholarship student.